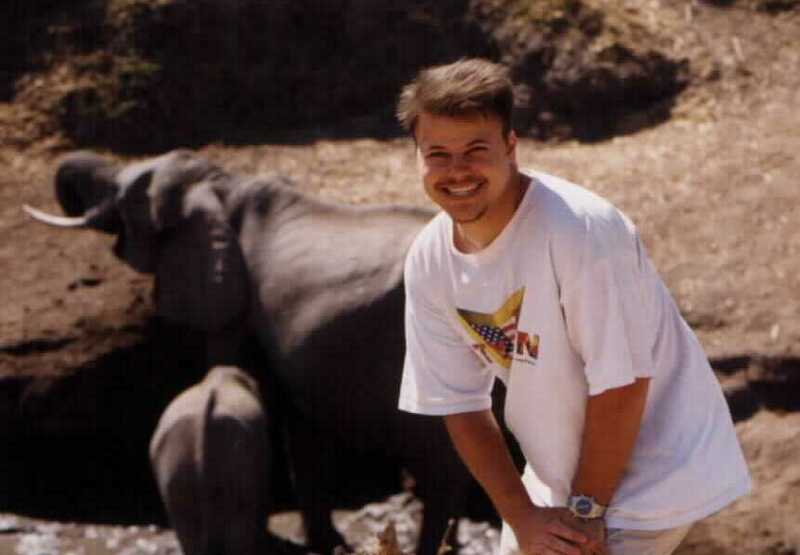 (CHRIS) It was a pleasant morning to be alive in Africa, so we slept thru the alarm again. We ventured out of camp around 7. 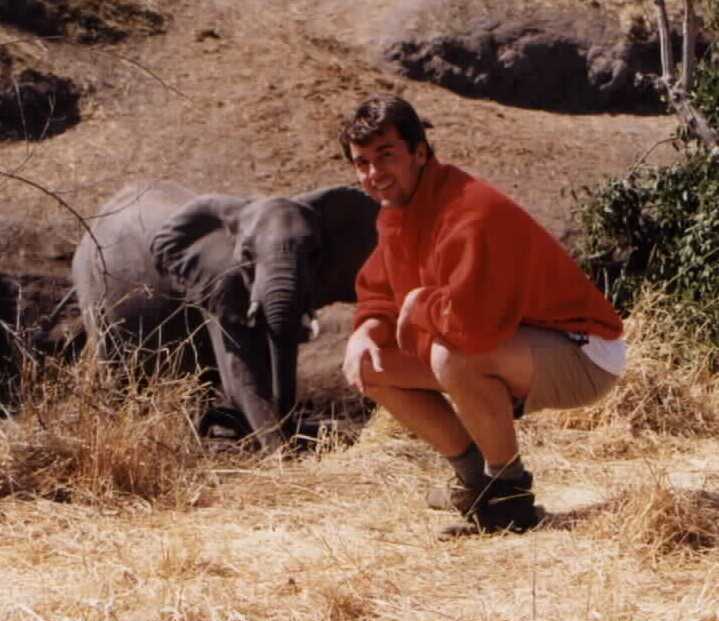 The best animals of Hwange were supposedly in the eastern section – also the area with highest tourist concentrations. We decided to go there for sunset on our way out of the park. In the meantime, we headed west – towards Robins Camp. Our first sightseeing coup was early on. A white rhino was foraging 75 yds from the road. He paid no head to us – which is unusual for these shy creatures. But he was a bit far away for our taste. It is difficult to say for sure, but it appeared his horns had been cut off and a radio collar put on him. At a nice picnic site near a lake caused by a dam, we ate our morning bread, fruit, PB and Nutella. From that platform we saw fish eagles, hippos frolicking, and baboons. In the distance we saw BUFFALO! No, not the city, silly – the last of our Big 5 sightings. Sam said that they looked like old men with really bad hairpieces. It’s true – their awkward horns were parted in the middle of the bony tuft. Cool. Just down the road, we were able to observe a huge herd of these mammals. They had a lot of insect problems – they were constantly plagued. Not only that – little birds kept landing on them and stealing hair. Certainly didn’t seem to be relaxed creatures like hippos. They just stared at us nervously and at one point the herd shifted away from us. We continued on – seeing very few tourists and a good number of animals. Hwange’s roads were pretty good (except for an ill-maintained portion of the main road that was seductively paved but full of killer pot holes.) The park also had nice raised overlooks at many water holes. You could get out of your car, climb up the steps, and sit in the thatched shade to view thirsty game. We had some quality viewing of elephants, warthogs, impala, giraffe, and zebra. We saw a CAT hiding in a tree at “Viewing Spot #1.” Some Frenchies actually pointed him out to us and since we were the only 2 cars, we both pulled up to within 10 feet of the tree. OUR FIRST KILL! 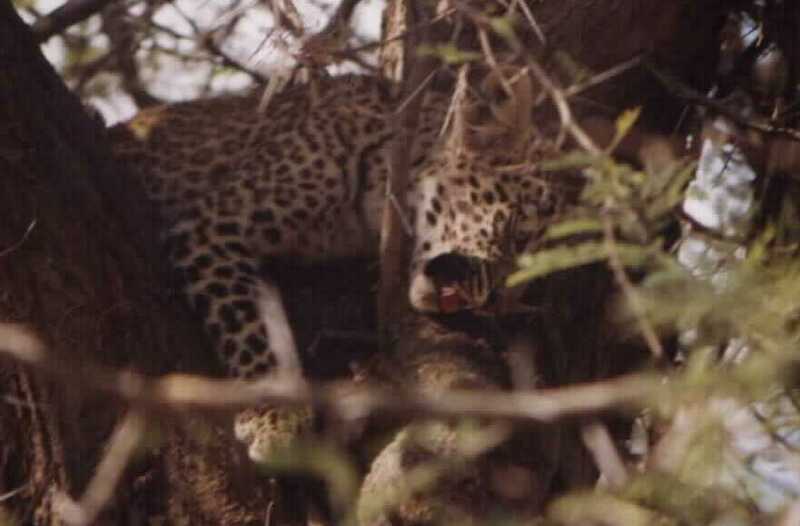 Yes, the young leopard was munching happily on a dassie or badger. We didn’t see the killing, but it was fresh meat and he had it in the crotch of the tree about 12 feet up. It was somewhat bloody and remarkably similar to house cat playing with a dead mouse. This cat was only 40 lbs. Or so. 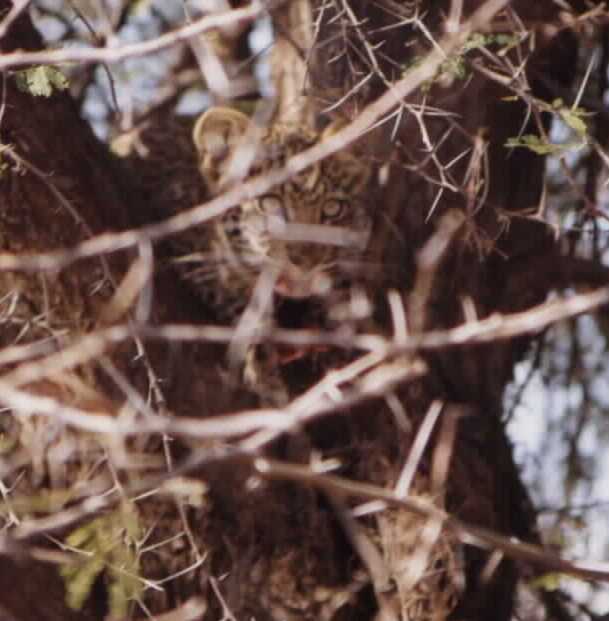 We noticed a larger leopard lurking in a shady valley nearby – watching us. It may have been mama who brought this kill to him. This larger one eventually slinked away, tho, and we were left with Junior eating away at his badger brains. Yummmmmy! He almost dropped his meal a couple times, but snagged it with a quick flick of his paw. We headed east, thru the desolate heart of the park. Not as many animals in this center portion – just an occasional elephant, kudu, or zebra. There was one major water hole view-site in this stretch, tho, and THIS is where all the animals had gone. We saw about 50 elephants up close and personal. They were drinking and bathing and scaring off a herd of thirsty zebras. The water was for the BIG BOYS only this time. We finally reached the loop of roads around Main Camp. Yes, these roads were congested with tour groups and no, the animals were not quite worth it. At the Ny#$%&*%@ Pan, we saw some ‘phants and Buffalo and we stopped at a lion traffic jam to see (barely) 2 lions ½ mile across a field. It was getting dark, crowded, and not very Tumbleweedesque, so we exited Hwange N.P. We decided to plow on to Bulawayo, Zim’s 2nd biggest city so the boys could hit Mass tomorrow. The drive was dark; the roads were good; we saw many people camping right next to the road. We talked of our grade school days. We got to downtown about 11pm. It was easy to find the well-marked caravan park in central park. The security guard had us sign in and we put up the tent and slept the sleep of the unthreatened-by-animals.